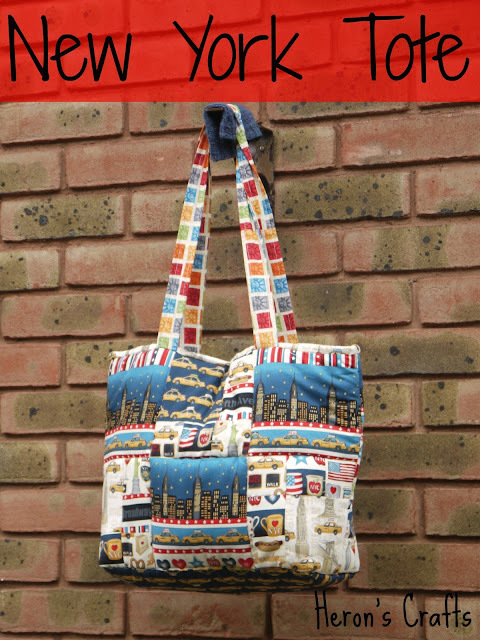 I adapted the 'Avril's Bag' pattern from the Simply Bags book sold at my local quilting shop Goose Chase Quilting. Between us, my Mum and I have made most of the bags in this book and we really like how they turn out. I decided on this large patch bag in order to really showcase the NYC skyline fabric that I had bought. I also added an inside zip pocket for my phone and other little bits. I am really pleased with how it turned out and it only took me an afternoon! I'm from Lichfield, which is just outside Birmingham! Hope you had a great time! The bag looks awesome! Great bag, really showcases those fabrics! Super Cute!I like the prints on the bag. I found you over at Sew Much Ado..